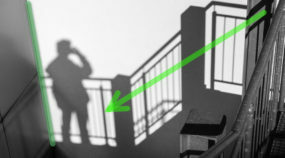 For ideal subject placement, photographers use a rule called the “Golden Crop.” To observe this rule, you need to place your subject on the “Golden Mean” intersection—that’s the intersection of two of the dividing lines that you can get by dividing the image’s space into two parts, where the ratio of the larger part to the smaller part (it’s about 1.6 times bigger) is the same as the ratio of the whole picture to the larger part. We can find many things in nature whose organization reflects the Golden Mean—for example, the leaves on a branch, the scales on a pine cone, the shell of a snail, and even the human body. Thus, compositions based on the Golden Mean are more harmonious for the human eye than other compositions. But in practice, this is too complicated to do. So we usually divide the picture into thirds instead. To get the knack of placing your subject on Golden Crop points, start by working with the composition tools offered in a photo editor. Just open up a photo that you’ve already taken, and use a cropping tool (like the one in the Editor in Zoner Photo Studio) to adjust its composition appropriately. 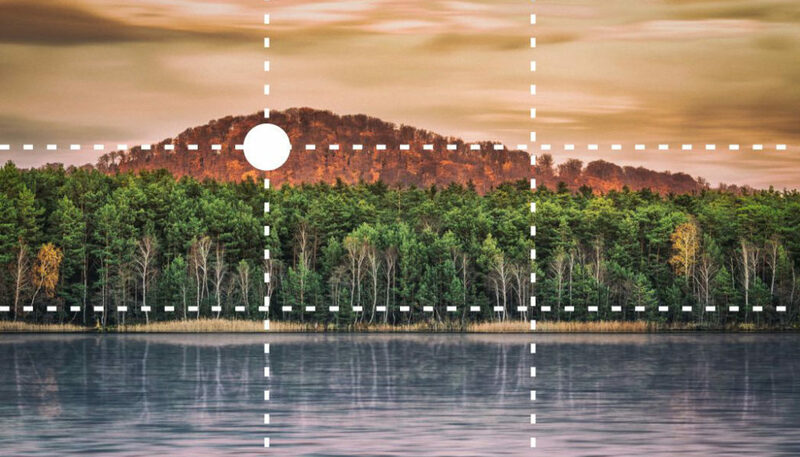 The majority of photo editors today can show a grid depicting the Golden Crop points, and/or the Rule of Thirds points. Over time, this rule will become second nature for you, and you’ll start to be able to apply it automatically before you take your shot. If your camera can show a reference grid on the display, don’t hesitate to harness this ability while you’re composing. 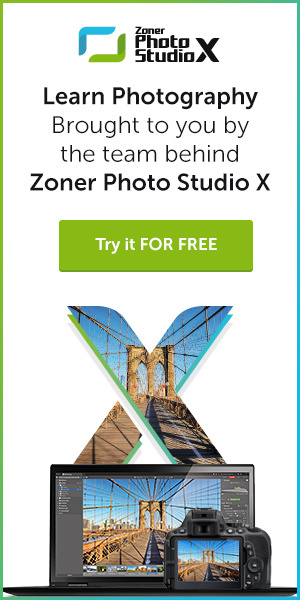 In the Zoner Photo Studio Editor, pressing TAB while you’re working with the Crop tool shows a Golden Crop grid, and then a Rule of Thirds grid. 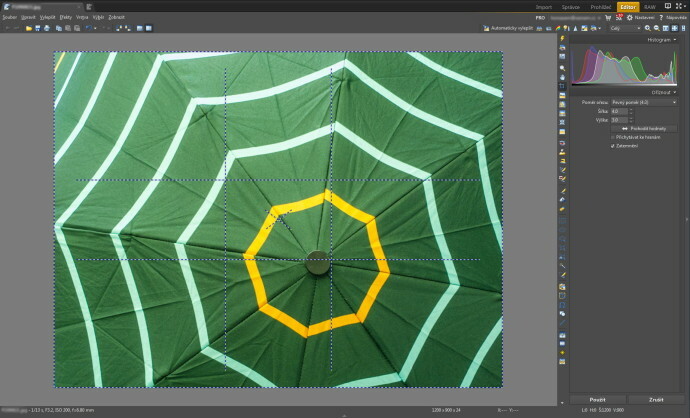 In the sample photo, I placed the center of the umbrella on the Golden Crop point already while I was taking the picture. You’ve probably noticed that the Golden Crop lines (and the simpler Rule of Thirds lines) intersect in four places. So you have four different options for where to place your subject while still respecting the Golden Crop rule. Ideally, you can put your main subject on one intersection while occupying another intersection with a secondary subject in the background that optically balances out your main subject. When deciding which intersection to use for your subject, it’s good to keep in mind how we read (here in the West). Both text and pictures get to read from left to right and top to bottom. So we start by looking at the top left intersection and finish up at the bottom right. And the bottom right is also generally considered the most appropriate spot for placing the subject. Ideally your audience “reads” the whole photo and stops at the subject, prompting them to think about the photo and (if you really succeed) to go back to the beginning to read it again. The tool that will help you to inspire them to read this way is guidelines—which we’ll be covering in upcoming articles. 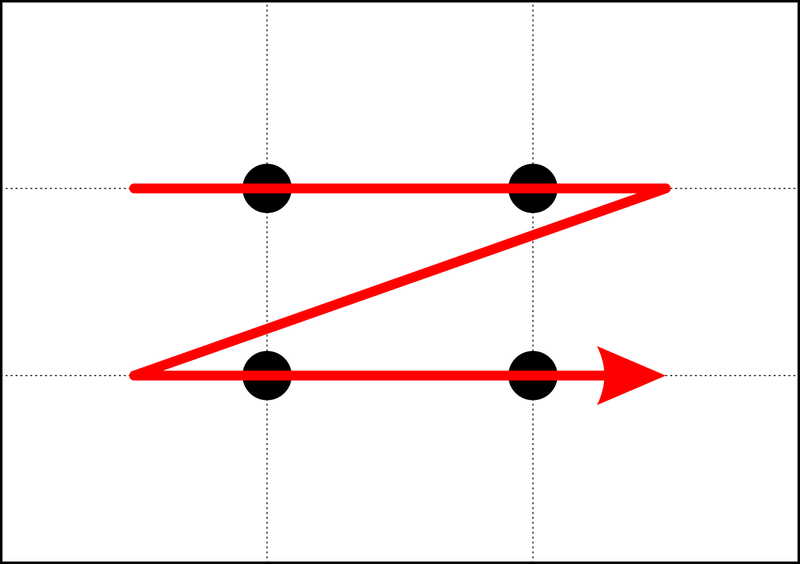 This diagram shows a simplified Golden Crop, with markings for four places where you can position the subject. The red arrow indicates how your audience will read the photo. 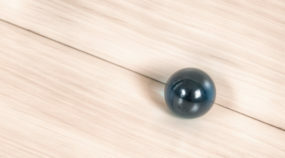 In my sample photo, the main subject (a forgotten empty bottle) is positioned closer to the right edge of the photo than the golden crop point is. Because of this, I placed a secondary subject—a television tower—on the left Golden Crop line. 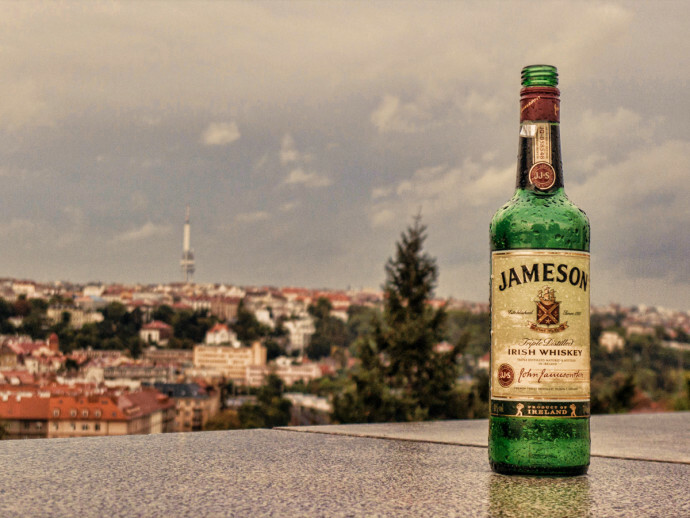 Although it is less visible than the bottle, and the small depth of field I used has also left it blurry, its universal symbolism and its size balance out the picture well. Dividing a picture’s area into thirds is not just a simpler way to respect the golden crop. It’s also, and above all, a way to divide up pictures that contain multiple planes. 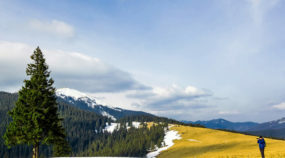 One typical example is landscape photographs, which usually include a horizon line. For these, it’s a good idea to place the horizon line one-third of the way from the top or the bottom. If the sky is uninteresting, then place the horizon on the top dividing line. Meanwhile, if the sky is exceptionally interesting, you can place the horizon on the bottom dividing line to leave more room for the sky. An example of rule-of-thirds composition. The horizon has been placed on the image’s top dividing line; the subject (the church tower) has been placed upon the top right intersection. 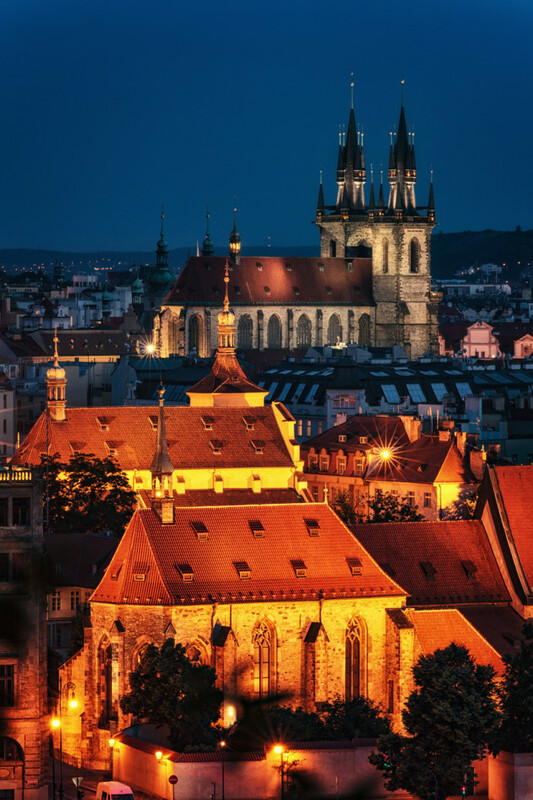 Three churches balance out the bottom-left part of the composition. The rules of dividing the picture into thirds and composing to the Golden Crop points are used in all photographic genres, and for most topics (including abstract topics) they markedly improve your photos. So don’t hesitate to use them.